Note: This post was updated March 1, 2015 with a new photo. The review and other content remains the same. And I do still LOVE this book as much today as I ever have! It is my go-to freezer cooking book. When I first started freezer cooking, the very first book I purchased was 30 Day Gourmet and it was a HUGE help. 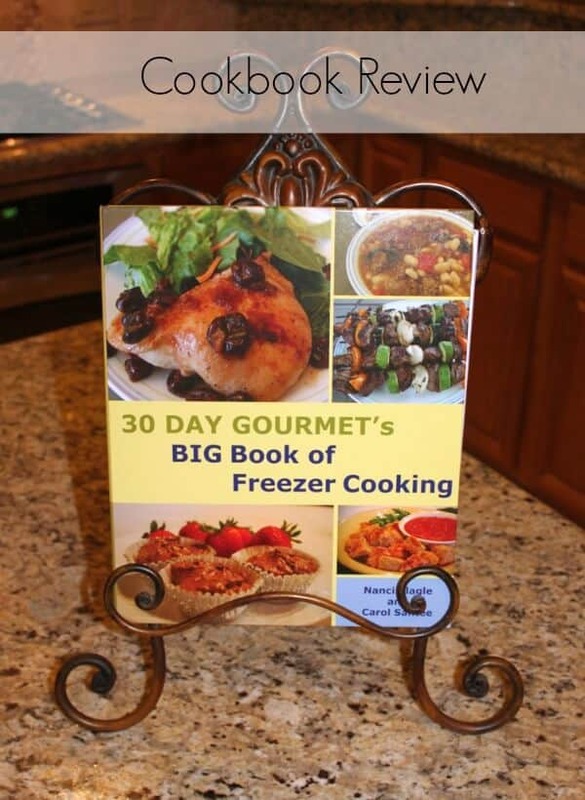 Now, authors Nanci Slagle and Carol Santee have updated the original edition with this expanded version, 30 Day Gourmet’s BIG Book of Freezer Cooking and I love it even more! The authors take the reader on a step-by-step journey of the benefits, myths and planning for freezer cooking. Tips on where to shop, how to shop, containers to consider and assembly day hints are great for beginners and veterans alike. The real bonus is the planning worksheets that help streamline the process and take out a lot of the guesswork! The Appendix includes multiplication and equivalency charts (want to know how much two tablespoons equals if you’re making four recipes worth? (it’s half a cup!) They even include cooking terms and definitions and a section on choosing and maintaining a freezer! Then there are the recipes! There are some repeats from the first edition and many new ones too. Some of our favorites that we love over and over include Caesar Chicken Marinade, Bourbon Mustard Pork Tenderloin and Garlic Smashed Red Potatoes (made this for my freezer exchange group–they were all hits!) . Don’t just limit your freezer cooking to entrees. There are a ton of Bread and Breakfast recipes included like Super-Easy Freezer Crescent Rolls or Crunchy Granola Bars; Soup and Sandwich Recipes like Taco Chili or Teriyaki Sliders or Sides and Sauces like Freezer Cole Slaw or White Sauce (a great substitute for canned, cream soups) and even Desserts!. Each recipe does the math for you with ingredients listed for single recipes, doubling all the way through six. Recipes are easy to understand and include assembly, freezing, and serving directions and helpful notes and nutritional information for each recipe. Book owners also get access to many more online recipes by using the access codes provided in the book. 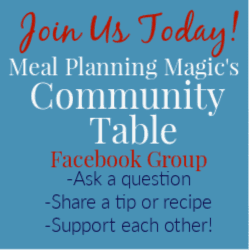 And even non-book owners can sign up for the monthly newsletters at 30 Day Gourmet to receive tips and more recipes for freezer cooking! I love that it is ring-bound which means it lays flat for easy use. My only (minor) criticism is that some of the pictures are a little dark. All in all, the book delivers a great resource for freezer cooks. Be on the lookout for a giveaway of this cookbook coming soon! Disclosure: I was compensated with a preview copy of this book but had planned to purchase it before the authors contacted me for a review. My opinions are my own and not influenced by my compensation.